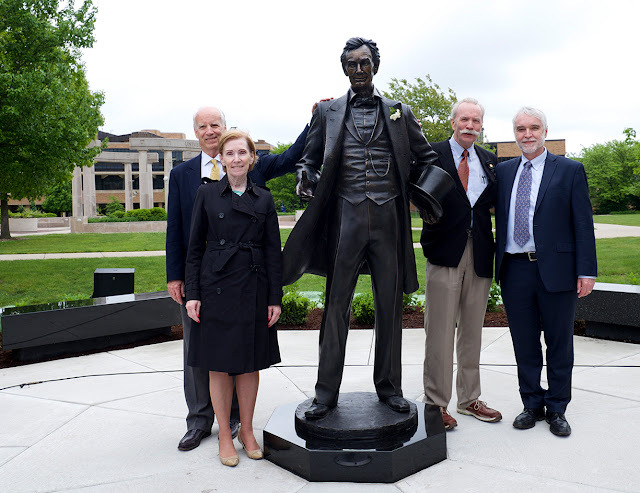 The University of Illinois Springfield unveiled The Young Lawyer, a 6' 4" statue of Abraham Lincoln sculpted by renowned artist George Lundeen, on May 10, 2016. The statue is located on the quad between the Public Affairs Center and University Hall west of the colonnade. The statue depicts a happy Lincoln as he would have appeared when he was studying to become a lawyer in his late 20s or early 30s. “It seems to me in this remarkable statue that George has captured the vital spirit of the young lawyer in Springfield,” said Michael Burlingame, the Chancellor Naomi B. Lynn Distinguished Chair for Lincoln Studies at UIS. Chancellor Koch was joined at the unveiling by University of Illinois President Timothy Killeen and student Faith Hook, who helped to uncover the statue. “I imagine years from now Lincoln’s outstretched hand on this statue will appear gold, as students grasp it for good luck,” said Hook. Lundeen, an artist known for his highly polished bronze statues of historical figures, spoke thanking the university and those who helped him create the statue. Burlingame closed the ceremony by reflecting on what he thinks Lincoln would have to say about the statue. “Here we have Lincoln smiling and I would like to think he is saying to the students, as they admire the statue, work, work, work, quarrel not at all, and enjoy your time here and thank god you’re getting a college education,” said Burlingame.